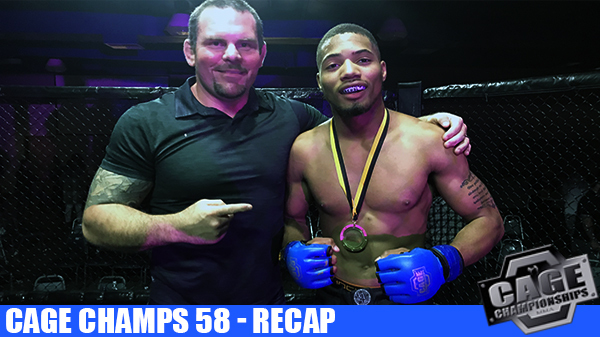 It was a cold evening in Sullivan, but the crowd turned up, and the action moved along quickly making for an exciting Saturday night of amateur fights at Cage Championships 58. In Cage Champs' third event of the year, there were ten fights on the bill with plenty of K1 action dominating the night. Main event honors went to a couple of grapplers looking to move more seriously into MMA, but it was a women's MMA bout that had everyone talking after the final bell. In the main event, despite a lot of early pressure from his opponent, Orlando Sanders weathered the storm and scored a TKO victory halfway through the second round. The 21-year old Sanders from BJJ LIfestyle's Academy in Belleville remained calm throughout a bad first round and waited for his opportunity to score in a victory over Kris Gonzales. From the first bell, Gonzales looked for a submission, going for a flying triangle to start things off. After getting the fight to the ground, it was Gonzales planted on his back with Sanders securing a full mount, landing a handful of punches from top position. A sweep got Gonzales free, and from there he was able to take the back and work for a rear naked choke before the round ended. "It was tough; he's a beast on the ground," Sanders said. "I just stayed true to my training and stayed true to the game plan. I'm very confident on my back, not over confident, but I just stayed calm and worked out of it." In the second, Gonzales again went to work on his jiu-jitsu attempting to drag Sanders to the mat, who was having none of it. Near the end, Gonzales went for an Iminari roll, unsuccessfully. With Gonzales on his back, Sanders sensed victory and started landing punches from a standing position, eventually getting the stoppage and improving to 2-0. In a K1 title match, Johnny Cox from Fearless Fighters took on Willie Henderson. In the first Cox, the more experienced striker walked down Henderson while scoring points with his combinations. In the second Henderson reversed the tide and started to use his range to keep Cox at distance. A well-timed knee bloodied the nose of Cox and won Henderson the second round. In the third Henderson continued to cruise as Cox started to fade, and when the scorecards read, it was Henderson taking home the title. In a fight of the night performance, Kia Lola made her Missouri MMA debut against Sunni Shemwell and came away victorious in a three round decision. Lola out of the American Top Team in Atlanta, GA was calm under pressure and used a polished ground game to score points with her ground and pound and was always putting her opponent into dangerous positions. The fight was Shemwell's MMA debut, and what she lacked in experience, she made up for in grit. From the first bell, the fight was on, and it was Shemwell who took charge, looking for a submission via guillotine. Despite Shemwell holding on to Lola's neck for most of the first round, Lola escaped and sought after a standing arm triangle that transitioned into a big slam to the mat. In the second, Lola took over keeping Shemwell on her back for most of the round. Lola stayed active on top punching Shemwell when the opportunity presented. In the third, it was all Lola who continued to punish Shemwell with hard punches from top position. Despite stuck in a lousy spot for nearly two entire rounds, the fight never left Shemwell, and she continuously worked to try and get free, even landing punches from off her back. Joshua Woodrum was darn impressive in a heavyweight men's K1 match. Woodrum was throwing heavy kicks and punches and dropped his opponent Parker Weathersby twice in the first round before referee Jason Powell waved off the fight. Despite coming out strong from the start, cardio got the best of Laura Bowman who couldn't answer the bell between rounds giving Jessica Smith a surprise victory in a women's K1 match-up. It looks like the pieces are starting to fall into place for Ace Anderson. The lightweight out of the Academy of Courage has been on a bit of a hot streak as of late winning his last seven MMA bouts in a row. Anderson only needed a few seconds to earn his second straight win at Cage Champs coming via first round KO. Anderson - a 2016 STL MMA Knockout of the Year nominee - connected with a short hook on the chin of Michael Nguyen to put Nguyen out on his feet. The Smith Pit's Kody Ettinger made quick work of "The Parking Lot" Zach Zerna in a men's K1 bout. Zerna earned the nickname "Parking Lot" after agreeing to take a short notice kickboxing match last spring when the Cage Champs matchmaker found him standing around in the parking lot of the Big Eagles Hall. AOC's James McAffie continues to rack up the wins, scoring a first referee stoppage over Damon Weathersby. 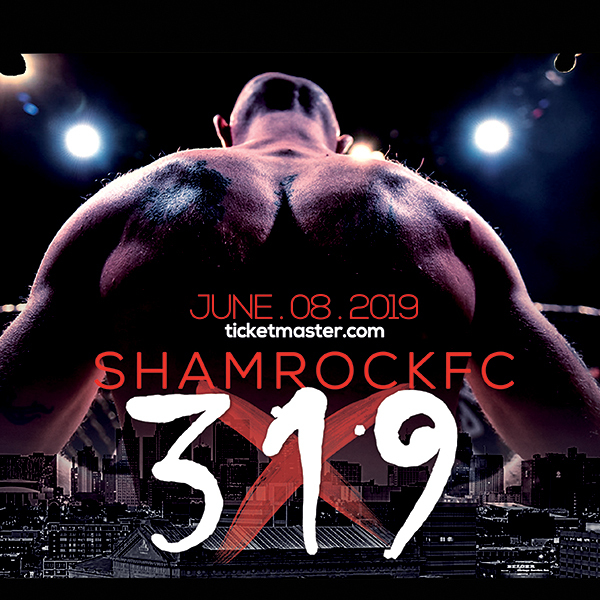 Preston Eason defeated Brandon walker via unanimous decision, and Jon Graves and AJ Johnson got the crowd revved up with a fun, but wild kickboxing match with Graves taking hope the win in the second when Johnson could not continue. Clayton Whaley and Ethan Greenlee kicked off things with an exhibition grappling competition with Whaley scoring the only submission in the lone, five-minute round. That wraps up things for Cage Champs in 2017 with three events in the books, and some great action along the way.